Checking in and checking out was very efficient with almost no waiting. We had a great week at the beach. The condo was excellent with a lot of amenities, and the views just can't be beat. Wonderful time! The team was very pleasant and knowledgeable. We had a fantastic time with great family time and an all around relaxing and care free vacation. Couldn't ask for more! Everyone was helpful and I felt like our family was secure on your property due to the constant supervision of your staff. We absolutely enjoyed every minute of our stay at Summerwind and will definitely be back! We enjoyed the quietness of the atmosphere. Not once did we hear anyone being so loud that it was a disturbance. It felt like home. We had to check in late and the staff called to give us details on obtaining our room information and also emailed it me. Very easy to understand. We will definitely stay here again and preferably in the same condo. Our condo was beautifully decorated and very clean. Navarre was much more peaceful than Destin and nowhere nears as congested. This property was very family friendly there wasn't any loud drunk people only one incident of teenagers yelling from the balcony and that was the USA vs Germany soccer game! If you want a quieter pace vacation, this is the spot. Quiet. Great balcony. Air conditioner worked. Your team members were extremely helpful and courteous. 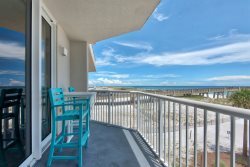 My family has stayed in Navarre for over 25 years, this specific condo is by far the nicest in which we have stayed. There were sufficient places for everyone to sit in the common area, which is important to us. The kitchen was well stocked with the essentials and we just can not say enough about the decor. We absolutely loved our stay and will most definitely be joining you again. Thank you! Everything at this property was great. My family of 3 loved our stay! I would highly recommend.